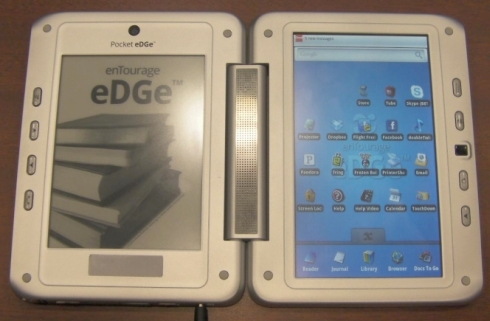 Entourage has come up with the refurbished, refreshed and reconfigured dual screened e-book reader and tablet combo device in the form of the Pocket Edge. The device though shares many or perhaps most of the features of its bigger sibling, the original Entourage Edge and the only remarkable difference between the two is the smaller size of the Pocket Edge, which justifies the Pocket tag of the device. But is the Pocket Edge as good or as bad as the original Entourage Edge. Or is it something that would make for a sensible buy. Hopefully, we can reach to that by the time we are towards the end of this review. As has already been mentioned, the Pocket Edge is a dual screened device that includes a 6 inch E Ink screen with a Wacom touchscreen on the left while the right is taken up by a 7 inch LCD touchscreen. Both have been ‘pocketized’ from the earlier 9.7 inch e-ink display and 10.1 inch LCD screen that the original Edge came with. The two screens are hinged at the center that allows them to be folded like a book or spread them open a full 180 degrees. The device is still targeted at the student fraternity or anyone who finds the device appealing enough. Sporting compact dimensions, the Pocket Edge measures 5.5 x 7.5 x 1.0 inches and weighs a quite convenient 1.35 lb. Both the screens measure half an inch in thickness. Behind the hood, the Pocket Edge comes equipped with a 4 GB internal memory though its only 3 GB that is usable, which again can be worked upon further by way of the micro SD card slot. Then there is a standard USB port, a mini USB port, a 2 MP camera that is both video and still picture capable, integrated microphone and stereo speaker, as well as a 3.5 mm headphone jack. There is also a USB-Video adapter that will allow one to project presentations for a larger audience. The Pocket Edge can connect to the internet through 802.11 b/g Wi-Fi while 3G is out of the loop. The Pocket Edge also supports Bluetooth. Also, while Entourage is not claiming access to the Android Market with the the Pocket Edge for downloading apps, the device on its own comes pre-loaded with a quite a few essential apps such as calculator, dictionary, contacts, web browser, email, youtube, notepad and so on. Entourage though has its own store front that has on offers a sizeable collection of e-books, music and periodicals. In fact, Entourage is claiming a huge collection of over 250,000 trade books along with a vast array of New York Times best sellers. These apart, the store also boasts of more than a million free public domain books that have been digitized by Google. Also available are over 1,300 newspapers sourced from as many as 82 countries and in 39 languages. Then there is something for the music buffs as well as the store has on offer in excess of 8 million music tracks and albums featuring all major and independent labels. The e-reader part of the Pocket Edge is made up of a 6 inch sized e-ink enabled screen with a resolution of 800 x 600 pixels having 16 shades of gray. Also, with the e-ink display, the usual benefits associated with e-ink is also there for the taking in Pocket Edge. These include, a glare free display, ability to read even in bright sun light along with extremely frugal battery requirements. The e-ink screen is also Wacom Penabled that allows one to easily take notes and annotation with the stylus that comes bundled with the device when it is in Journal mode. This technology also allows users to mark documents such as notes, recipes or contracts, as well as shares these with friends and contacts as PDF files. The Pocket Edge lays claim to the tablet tag on the back of a 7 inch LCD Resistive touchscreen that is receptive to both finger or stylus inputs on screen. There is also an optical finger pad as well. The tablet is Android-based and can play back movies or MP3 files, organize your books, notes, and pictures, or send messages and e-mails. One is also able to do all that that can be done on the internet with the Pocket Edge. The tablet’s built-in audio recorder enables users to record lectures for playback or sharing later on while the integrated video camera allows for recording still images or movies as MP4s or 3GP files. The tablet part also includes a virtual on screen keyboard to type instant messages or emails or for those who’d prefer a standard keyboard can also have them attach to the Pocket Edge via USB. The two screens also interact with each other in a unique manner. For instance, users will be able to search a particular term or any key words from e-books in Google, or the built-in dictionary or via Wikipedia on the tablet side. Powering the Pocket Edge is a Lithium-ion polymer battery. However, being a twin screen device incorporating two different technologies, backup time depends solely on how the device is put to use. Like the Pocket Edge will continue to operate for 6 hours on a single full charge with both its screens being put to use. Also, usage time will go up considerably to 11 hours if the Pocket Edge is used only as an e-reader. No surprises here as the power saving qualities of e-ink is already well known. However, on the flip side, the battery is not user replaceable though Entourage is claiming the battery will be good enough at least four years before its performance begins to degrade. 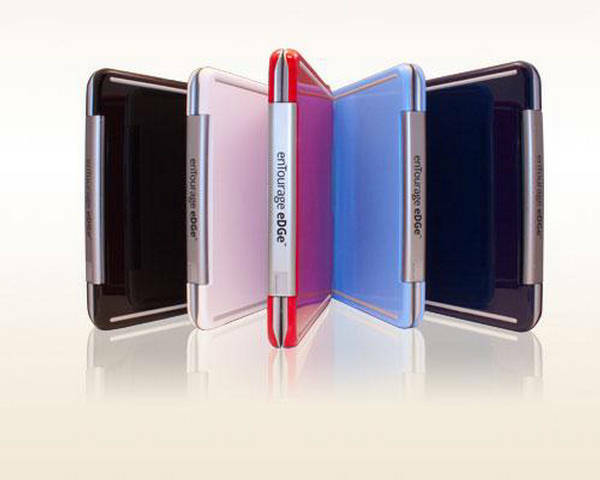 Entourage is marketing the Pocket Edge as a multi-purpose device that can be a single answer to a lot of requirements. Its a device that can be used to read e-books, write notes, surf the web, record and play back audio as well as video, take photos and view them, create word, excel and powerpoint files and so on. And for the Pocket Book to be able to accomplish all of these, the device is found to be compatible with different file formats. For instance, the tablet part of the Pocket Edge can decipher files types MP3, WAV, 3GPP, MP4, AAC, OGG, and M4A. 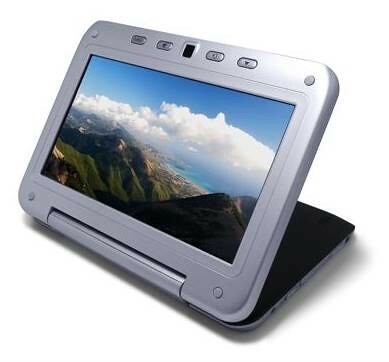 Similarly, the Pocket Book as a tablet can play back video file types such as 3GP, MP4, Adobe Flash Lite® (H.264), AVI (DivX or Xvid encoded), MOV, and WMV. 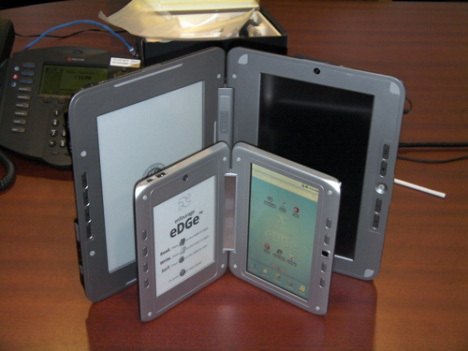 However, as an e-reader, the Pocket Edge has been found compliant with only ePub and PDF. Also, its here that the Pocket Edge throws up some interesting facts as unlike the original Entourage Edge, the Pocket Edge has been made for a more general application unlike the former that is targeted primarily at the student community. This is in spite of the fact that while the Pocket Edge does allow for the PDF files to be zoomed in and zoomed out, but there is no way one can reflow the text to make them adjust to the display on smaller sized screens. >> The device feels rugged as a whole. >> Chances of the screens getting damaged is virtually non-existent as both close in on each other and is not exposed. >> First device to offer both an e-ink and a LCD screen is now even more pocket friendly. >> At $399, its not too pricey to have a device that is both an e-reader and a tablet device at the same time. >> Android 1.6 OS which is almost historical. >> At half inch when open, the device is a lot chunky compared to the more recent e-readers we have come across. >> The LCD touchscreen does not support pinch and zoom feature. >> No access to Android Market. Unfortunately, this can’t be answered with a simple yes or a no. Rather, its a question of whether the Pocket Edge suits your requirement or not. Or whether, you need the Pocket Edge. If you have lived with the original Edge and found it convenient enough, the Pocket Edge can make things even more better for you as its now more compact and light. Its also easier to carry around now. The OS, in spite of it being still Android 1.6 is a lot faster than the original Edge, which is all the result of a thorough optimization job accomplished on the Google operating system on part of Entourage. Sure there is no Android Market here but the Entourage online shop is enough to take care of most of your requirements if not all. Its not without its own shortcomings. 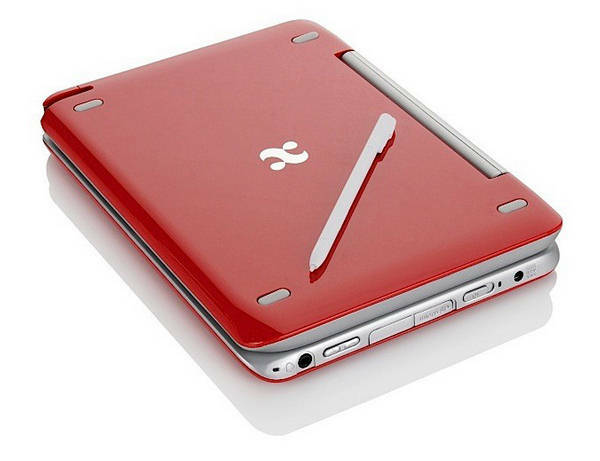 But that’s how the world’s smallest dualbook device is and at $399, its something that you can definitely consider trying. This device is very deceiving, especially when it comes to the flash player. What good is it with a proper flash player. Boa noite, ganhei de presente um tablete desse. Sou brasileira e gostaria de saber se esse tablet tema opção em português? Gostaria muito que alguém me ajuda-se obrigado.